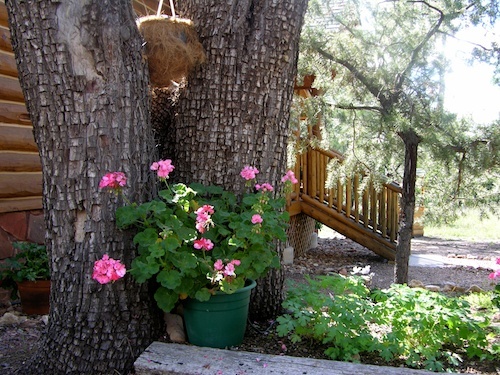 If you are going to spend a summer in the mountains what sweeter place could there be than “Happy Jack?” Once again my peppermint twist geraniums summered here escaping the killing heat of their winter home. So this week we drove up north to collect them in our new improved “geranium transporter” or Honda Ridgeline pick up w/ a topper shell so they can ride protected back to the valley. It holds nearly 25 pots of flowers with out bending or breaking of stems! Ever so much better than our previous truck! 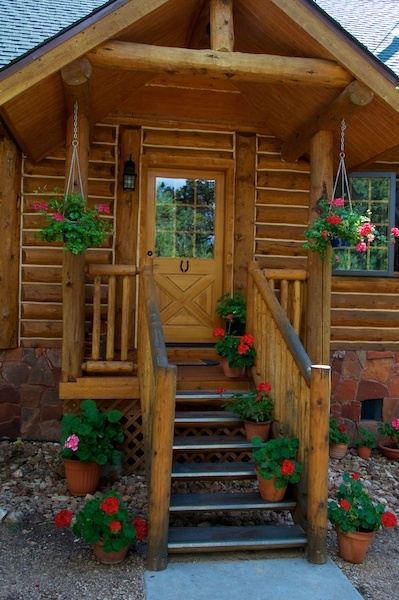 Arriving here the cabin is surrounded by pots of flowers. Josephine & Steve spend the summer here and both are gardeners. It has been an especially wet summer this year with nearly 20 inches of rain since July. The tomato plants are huge, the lettuces, carrots and zucchini have been very successful. The flowers have been happily blooming. Josephine and I are in the Tempe Garden Club and we both love flowers. She gets the advantage of an immediate garden when I bring up my potted plants in May. Neighbors are amazed at the size and blooms she has early in the summer. Then in mid September we drive up to bring them home and my neighbors are amazed at the flowers outside my window. We have a traveling garden. I am so happy to have my flowers back in the garden. They need a few days to acclimate so they are under shade on the patio till the temperatures drop below a hundred but once that happens garden season will begin. 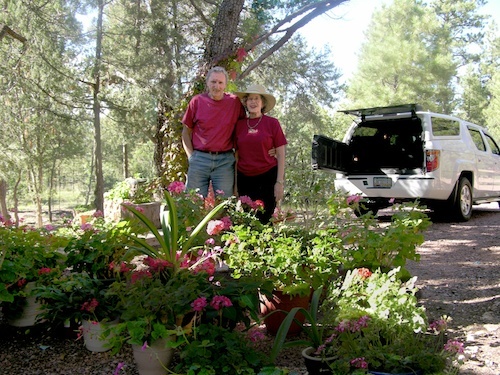 I really enjoy reading A Traveling Gardener and love the pix. 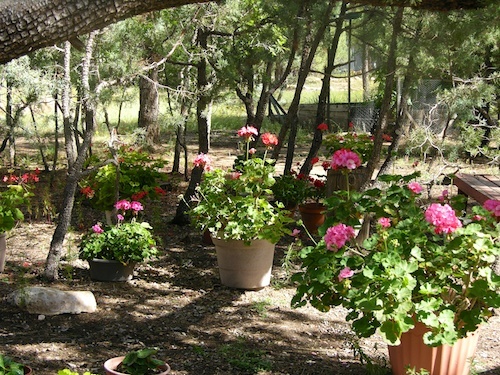 Maybe you could bring one of the pots of peppermint twist geraniums to a Desert Designers meeting so we could enjoy. I love this story since I know all the players and know how wonderful it is to over-summer geraniums! Previous Previous post: Trees Drop Stuff!